ICFAI Law School Admission Test ILSAT 2019 - ICFAI Law School has started registration for ILSAT 2019 Exam for BA LLB and BBA LLB Courses. The students willing to apply for the ILSAT 2019 Exam can now visit the official website. Interested aspirants who wish to seek admission into the above mentioned course have to appear in the ILSAT 2019. Applicants can apply for ILSAT 2019 by providing the required information in the online application form. Date of birth as recorded in the Secondary School Certificate will be taken as authentic. Applicants seeking admission in to BBA-LLB (Hons.) and BA-LLB (Hons.) 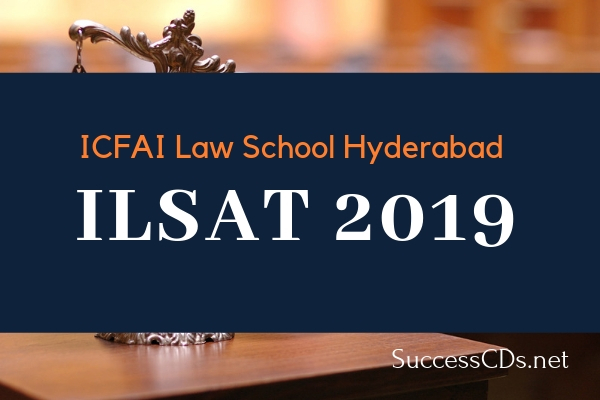 Programs need to appear and achieve the score in the ICFAI Law School Admission Test (ILSAT 2019) to be conducted by The ICFAI Foundation for Higher Education (IFHE), Hyderabad. Alternatively, CLAT 2019 / LSAT 2019 exam scores are also accepted. The last date for submitting the proof of Class XII (or equivalent) mark sheet is 17th September 2019, failing which the provisional admission will automatically stand cancelled. ILSAT 2019 is an aptitude test conducted in Computer Based Test (CBT) format. Applicants interested in appearing for ILSAT 2019 can apply by any one of the following methods. Applicants applying online should upload their passport size color photograph while filling the Online Application. The Law Programs Prospectus will be sent to such applicants. The Demand Draft should be drawn in favor of “IFHE-Prospectus Fee A/c ILSAT 2019” payable at Hyderabad. The Law Programs Prospectus will be sent to such applicants. (c) Fill the Application Form. Candidates seeking admission into the BBA-LLB (Hons) / BA-LLB (Hons) Program have to indicate Program preference in the application form.